The Art of Secrets by James Klise. Review: Smell the smoke? A fire has started, and it's burning down Saba Khan's apartment in Chicago. 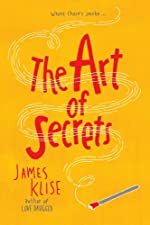 The Art of Secrets by James Klise tells the story about a fire that burns down an apartment and a community that comes in and helps them get back on their feet. The story begins when Saba's apartment burns down. She and her family lose everything accept their rusty old Ford. Saba's friends from school, Kendra, and her brother Kevin Spoon want to arrange a fundraiser at the school to raise money for the Khans. In a trash can, they find a piece of Henry Darger's artwork that is worth $100,000 dollars in a trash can and give it to the Khans for the auction. But good intentions turn bad when the painting is stolen! Teachers and students start to point fingers, as the auction gets closer and Saba's already complicated life gets even more confusing. What happens next? Will the artwork be found in time? There truly becomes an art to secrets! I really liked The Art of Secrets. It has mystery, romance, drama, and reality all combined into one engaging story. I think that some of the language is not necessary for a young adult book. In addition, the story contains some adult concepts that may not be appropriate for younger children. That being said, both boys and girls would like this book, although certainly the romance is geared more to girls. But anyone who enjoys a good mystery would enjoy The Art of Secrets. All in all, I think that this book is good for middle school and young adult readers. I really liked this book and I'm sure you will too! We would like to thank Algonquin Young Readers for providing a copy of The Art of Secrets for this review. Have you read The Art of Secrets? How would you rate it?